Monica was born in 322 into a Christian family in Tagaste, in North Africa. Her parents selected a husband for her, a pagan named Patricius, who was a bad-tempered man and unfaithful to her. To add insult to injury, his mother, who taunted her and told lies about her, lived with them. But Monica ignored the indignities they heaped upon her and practiced good works instead, giving to the poor and helping the sick while still caring for her family. Monica and Patricius had three children. The eldest son, Augustine, although a talented scholar, was a source of constant worry for Monica. She prayed constantly that he and her husband would someday join her in worship. Eventually, her faith and kindness were partially rewarded: her husband and his mother converted to Christianity. But Monica's son Augustine seemed hopeless. Although she set a good example for him and did everything in her power to ensure he grew to be a good, decent man, she simply couldn't make him behave in a Christian fashion or understand the importance of proper conduct. He ran away from school, returned to the house and insulted Monica. She forced him out, but took him back after a voice told her, "your son is with you," which she thought meant with her in the faith. He took a mistress, had a son, and ignored his mother's protests. Still, Monica did not give up. She realized she couldn't do everything on her own and wasn't afraid to ask others for help, even if it embarrassed her. Monica sought the help of her local bishop, who encouraged her. "It is not possible the son of so many tears should perish," he told her. Eventually, Monica turned to the Bishop Ambrose in Italy, who brought Augustine to God by appealing to his intelligence instead of his emotions. Monica's goal eventually came to pass, in ways she didn't even foresee. Her son became so strongly drawn to the faith that he was eventually canonized - as St. Augustine, one of the Church's greatest teachers and philosophers. 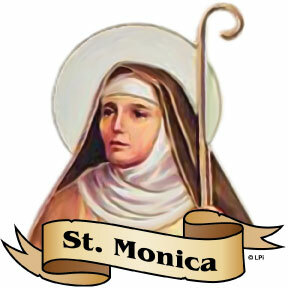 O Lord who taught Monica to persevere for the good of her family, help me to be a better parent to my children. Help me to have patience with them when they misbehave and give me the strength to guide them gently to the right path. Permit me always to forgive their misdeeds and keep me from speaking harshly or punishing unwisely. Please help me to be a beacon of goodness for them as they grow to adulthood and to be a good example to them in all I say and do.